Found 5545 Stylus Ipad Products. DIMPLES EXCEL SLIM WAIST STYLUS PEN Introducing a brand new ELEGANT DESIGN of capacitive fiber tip stylus pen - Only by Dimples Excel. LUVING the feel of this stylus in your hand! So thin, yet very well balanced & WEIGHTY! 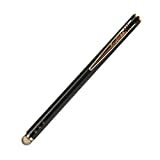 Why choose Dimples Excel Slim Waist Elegant Stylus? --With its streamlined design and added weight, this stylus feels great in your hand. 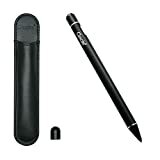 --This stylus features a 3mm radius smooth fiber Tip that gives you great precision and slide smoothly over the screen. --Dimples Excel provides you with replaceable fiber tips - the ability to replace tips as they wear out gives you maximum usage, value for money and reduces the environmental impact! What are in the package? 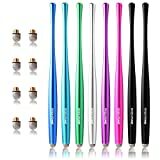 1 x 5.7" Slim waist stylus pen - available in multiple colors, choose your favorite set above 2 x Replaceable fiber tips SATISFACTION GUARANTEE: We take pride in delivering top quality products and are proud to offer 90 days money back guarantee in case you are not 100% satisfied and wish to return the product for ANY reason. Order now for worry free shopping. 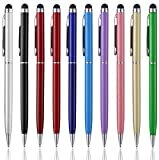 The anngrowy Touchscreen Stylus Pen has a convenient dual-purpose design that fits in your hand like an ordinary pen. One end features a high-quality stylus that offers ultra-sensitive, smooth use that is responsive as a finger touch. The stylus is covered with a durable rubber tip that protects your device's screen from fingerprints and scratches. The other end is outfitted with a quality ballpoint pen for writing notes or signing your name on paper. 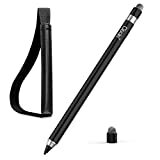 This versatile stylus pen(univerisal touch screen stylus pen) is 100 percent compatible with touch screen devices. It is suitable for any touch screen tablet such as Apple iPad, iPhone 8 7 6 Plus 6s SE 5s X, Kindle Fire, Samsung Galax Tab,Samsung S5 S6 S7 Edge S8 Plus Note 2 3 4 5, Nokia Lumia series etc. 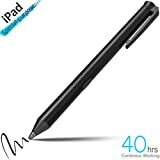 The benefit of using stylus pens is that it protects the screen from scratching or finger print and prevent your finger skin from becoming dry after a long period of using computers or phones. Has a convenient dual-purpose design that fits in your hand like an ordinary pen Features a durable rubber tip that protects the screen from fingerprints and scratches Specifications: Dimension: 5.4x0.3x0.3 inches/0.4 oz Aluminum body and aluminum clip Size of rubber tips may vary Package included: 10 ×anngrowy 10Pcs-2 in 1 Slim Capacitive Stylus Pen Color: Black,Blue,Purple,Dark red,Red,Rose red,Pink,Gold,Green,Sky blue,White,Silver Notice: Color may be vary slightly due to different production batch and the color calibration of each individual monitor,please refer to the real item you receive. 12 months Warranty If for any reasons you are not satisfied with our service or product, please contact us first. We take responsible for any un-expectable issues in 12 months. ABOUT THE STYLUS: -This stylus is rechargeable, can use and standby for a long time. -Elastic design inside, it can offer some buffers when clicking, give you a comfortable feeling when using. -Fashion design, frosting oxidized surface, it is antiskid and good for touching, and it is applied to the games, drawing, painting, etc. -This tip is high presice and is good for creation, suitable for painting and drawing. It makes the writing experience feel much more natural. PRODUCT PARAMETER: -Pen size: 140mm*9.5mm*9.5mm -Fine tip diameter: 2.0mm -Material: aluminium alloy -Battery: 120mA lithium battery, Micro USB charge connector -Usable time: can use continuously about 12 hours (don't turn it off and make sure full of charge in the first time use) -Charge time: 1 hours (5V 1A-2A) -Please use formal quality charger COMPATIBOLITY AND INCOMPATIBILITY: -It is suitable for most touchscreen tablets and phone, and it is better for drawing instead of our fingers. -It is NOT FIT for iPad Air 2, iPad Pro 9.7", iPad Pro 12.9". -Please use the tempered glass screen protector when use the pen. INSTRUCTIONS: -The new product should be full charged for the first time. -Starting up: Blue LED on. -Charge: Red LED is on when charging, Blue HED is on when charge complete. -Battery Exhausted: LED off. This HAHAKEE iPad stylus pen features high precision writing experience and long-term durable performance. Product Specification: Tip Diameter: 0.1inch Length: 5.67inches Charging Time: 4 hours Continuous Use: 40 hours Standby: 30 days Package Include: 1 * Presented Black Box 1 * Micro USB Cable 1 * iPad Active Stylus Pen 1 * User Manual Feature of Indicator LED: Blue-Means power on and battery power is in normal status. Green-Means power is charging, the green light goes out when power is full. Red-Means power supply is low and need to be charged, but it still can be used for 3 hours. None-Means power off. How to power on: Step 1:Press the button to power on. Step 2:Check the LED to make sure the battery status. Step 3:Don't press the button again to power off, it will power off automatically after the stylus pen move out the touchscreen. 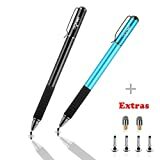 Kindly Note: This active stylus pen give best writing/drawing performance without screen protector, and different screen protectors bring different performance. Model:Fiber tip series - 4Pcs Color:Silver, Black, White, Champagne Contents: 4 x Capacitive touch screen stylus 4 x Replaceable mesh fiber tips 4 x Soft Replaceable rubber tips Specification: Length: 5.3 in ( 13.5cm ) Barrel dia: 0.34 in ( 8.6 mm ) Tip dia: 0.26 in ( 6.5mm ) Weight: 0.49 oz Material: made from stainless steel with metallic accessories, no plastic parts, high quality, real pen feeling Replacement Tips: Feature: extend life time of styli Material: fiber or rubberUniversal Compatibility: 100% Compatible with all touch screen devices such as iPod, iPad Mini, iPad air, iPhone, Samsung Galaxy Tab, Asus Transformer, Asus Nexus 7, Kindle Fire, Kindle Touch, Motorola Xoom Tablet, Blackberry Playbook, and many more. Our Service & Credibility:With the principle of credibility, ChaoQ group strictly control the quality inspection for each part of the stylus in view of we have more than 10 years professional production experience. Our Promise to You: If for any reasons you are not satisfied with our product, please do not hesitate to contact us first. At the ChaoQ we will take responsible for the quality of product. To find more different new designs of touch screen stylus/styli, pls search ChaoQ on amazon. This tablet stylus features a patented conductive fiber tip that glides smoothly across touchscreens and won't stick or skip like a rubber tipped stylus. 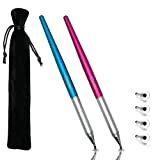 Its durable tip is ideal for writing, drawing, texting, gaming, and navigating, and the pocket clip makes it easy to carry your stylus on the go.